The 2nd. half of April has seen Pre-Monsoon rains lashing the Southern and Eastern regions of India.Though today, after a long break, we see the rains relenting to some extent in the East, but the Southern state of Kerala continues to enjoy the "rain bounty", and much to the relief of the state, the temperatures have come down considerably, after record breaking 40 degree heat in the state. The North-Eastern States had a fairly good spell of pre-monsoon rains, as mentioned. Traditional wet spot, Cherrapunjee, has recieved as much as around 3300mms of rain to date in April ! And that is 2588 mms above normal! Heading towards the 5000mms mark by May end ?? Passighat has recieved 926 mm, and is in excess by 626mm!! And most places in the North-Eastern states are 100% to 200 % in excess rainwise. In the South, Kerala and Karnataka have recieved, and continue to recieve the pre monsoon heavy thundershowers.Though T.N.did not get much rain, and would not normally, Kerala and specially coastal Karnataka is in excess. Thiruvananthapuram, as on 27th. has recieved 299 mms of rain, (for Mar/Apr, but almost all in April), excess by 163 mms. Now this total, is far in excess of rains recieved in this city, in April, in the last 15 years. Good, substantial inflow of moisture into the North-East, due to a trough running into the North-East Bay is the cause of this rain there. And, a good flow of West winds, into the South Western coast of India, has precipitated rains along the coast.It is resultantly breaking up the "high" there. Is all this now going to have a bearing on the advancement of the Monsoon? Is the heavy rain in the North-East going to effect the Bay branch? Cannot say now, but if the pre monsoon rains continue beyond, say, 10th. May, we may find some change in the arrival dates. 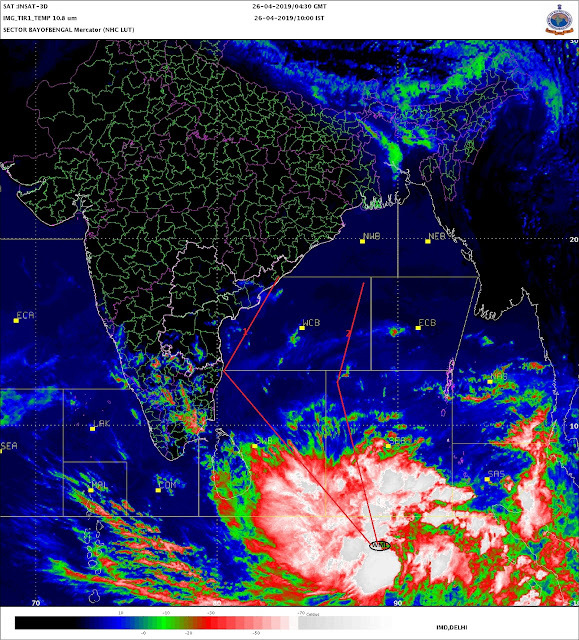 Maybe either way, if the pre monsoon spell converts itself into a regular south-west flow. We will discuss this as and when, with proper analysis in the Monsoon Watch series. Todays day temperatures were above normal in the central region. The 2 IMD maps show the extreme heat wave in the centre of India. Highest today (27th. April) in Asia was at Chandrapur, Maharashtra, at 45.2c.with the night at this place recording 30.8c. Nagpur and Gwalior followed at 44.5c. The map shows India in a clear North-South divide,weather wise. The southern temperatures were generally below normal, while the central region shows very high abnormality, and the rest of North/North-West India fairly above normal. The Climate Prediction Centre (NOAA) deviation map of last week shows that the maximum heat was in the Rajasthan region last week. Anyway, a major portion of the sub-continent was in an "above normal zone" throughout last week. Monsoon Watch - 4 will be up on the blog on Friday, 30th.April.